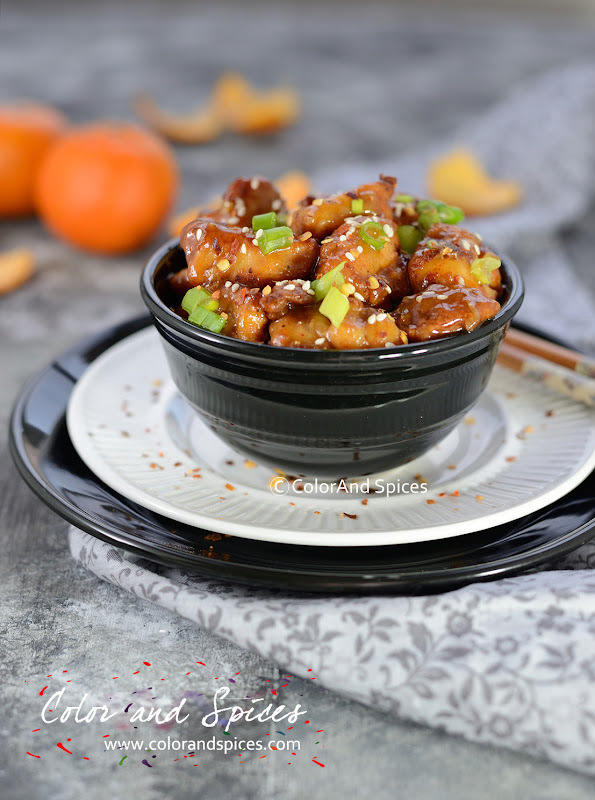 Though not an authentic Chinese dish, but very popular in American restaurants, Orange chicken can be found in every single Chinese restaurant in the US. 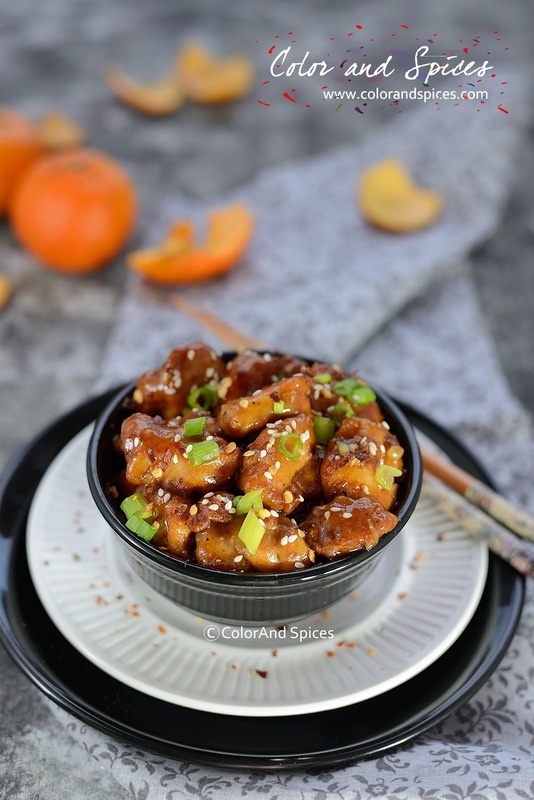 This Hunan style dish is flavored with orange juice and spiced up with dry red chilies. So it was Orange chicken for my weekend dinner. 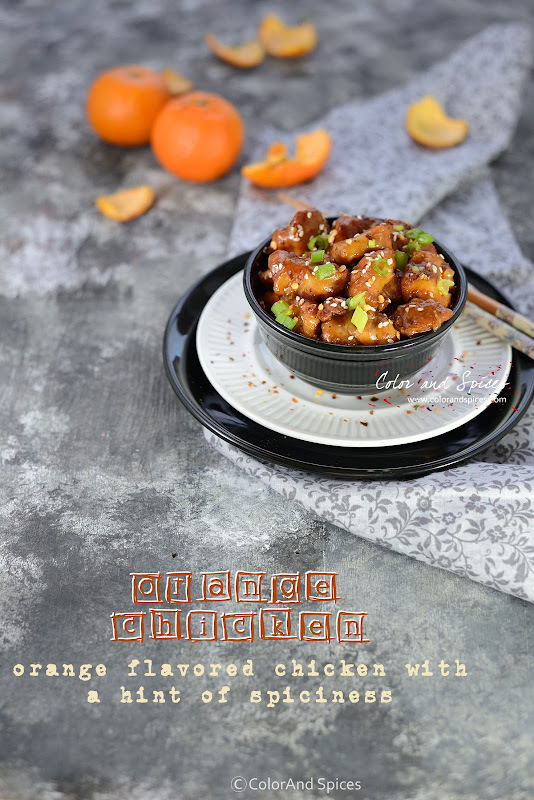 I adapted it from Rasa Malayasia's orange chicken recipe, and it came out very well. 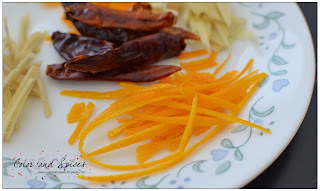 Note: When using orange zests, only use the orange part, do not use the white part of the orange peel, that will make your dish bitter. 1. Wash the chicken pieces and pat dry with a kitchen towel. Cut into bite size cubes. Marinate the chicken with all the ingredients under 'To marinate the chicken'. Cover with a cling film and marinate for 30min. 2. Mix all the ingredients for the 'Orange sauce', cover and keep aside. If the orange is sour then you will need more sugar, where as if the orange is sweeter then use less sugar. Just taste and decide. 3. Mix all the ingredients for the 'Batter'. Heat oil in a pan. Dip the marinated chicken pieces in the batter, shook off excess batter and deep fry till nicely brown and crispy. Keep them on plate lined with paper towel. Keep heat to high and do not over cook the chicken, that will make the chicken hard. 4. In a wok heat 2-3tsp oil. When the oil is hot add garlic and julienned ginger and dry red chili. Cook for 1 min. Add the chopped white part of the spring onion, cook for 1 min. 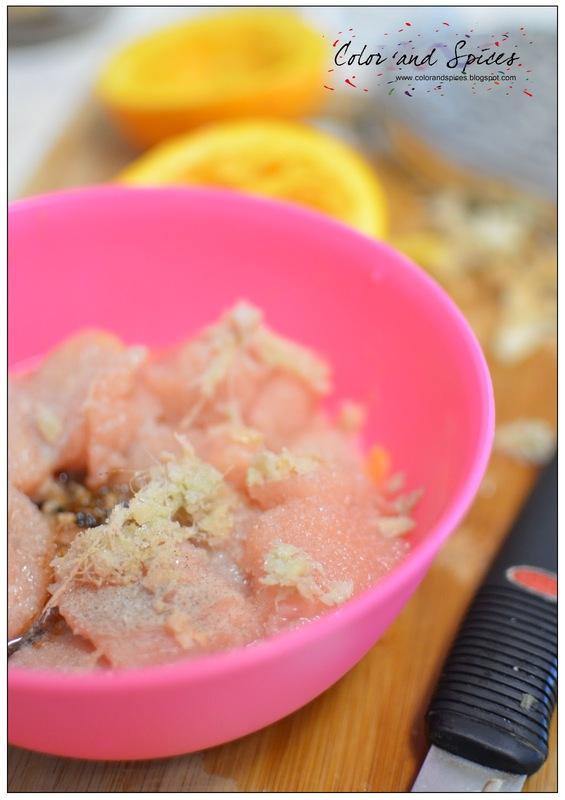 Add the fried chicken and orange zest. Mix well. Keep the heat to highest through out the cooking. 5. Add the orange sauce, cook till the sauce thicken. Transfer to serving plate and garnish with julienned orange zests and green part of spring onion. 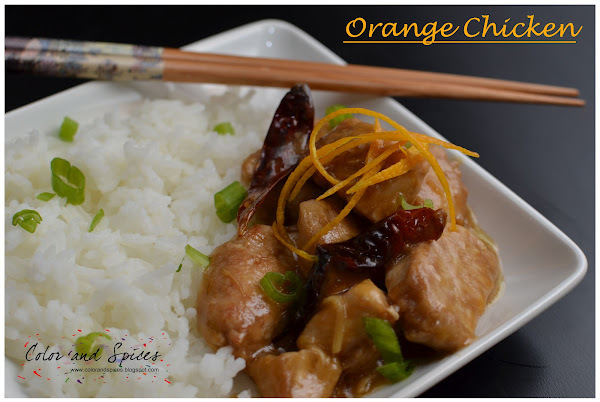 Above is the image I clicked more than a year back, when for the first time I cooked orange chicken in my kitchen.